The 19th century surveyors who laid out Tryon stuck a compass on the map and drew the town boundaries as a circle, the diameter of which was a mile and a half. At the center of that circle stands the Tryon Horse. 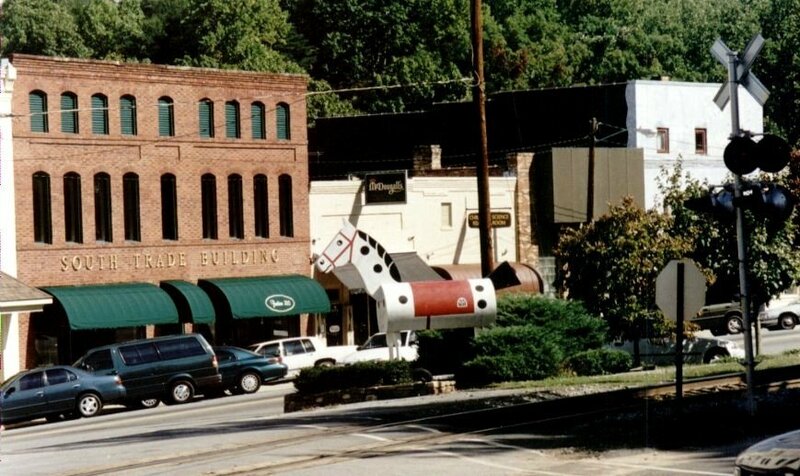 In season, "Morris" serves as the downtown billboard for the club, with dates for the Tryon Horse Show or the Block House Steeplechase displayed on his saddle pad. In earlier days when school let out and the stores closed for the horse show, the Horse was rolled down the road for signpost duty, giving visitors directions. The original Tryon Horse was destroyed in the 1930's when the building in which it was stored burned. The next Tryon Horse was ravaged in 1946 during a wild getaway ride when he was kidnapped - not for ransom, just as a prank - by a few local fellows who were enjoying a mason jar or two of "white lightning". The third succumbed to age and weather in the 60's; and the fourth Horse was totally restored in 1983, when he acquired a fiberglass body made by a boat builder. He stands twenty-two hands high without his top hat. Occasionally, the Tryon Daily Bulletin prints a letter from a reader who has had a conversation with the Tryon Horse. In those letters, the Horse is always referred to as "Morris", the name given him by a group of friends, the "Wilderness Road Gang", who put holiday garlands and a rakish top hat on the Horse every Christmas.